'No justification for violent intimidation that curtails free speech,' Britain's Universities Min. says after Jewish student event attacked. 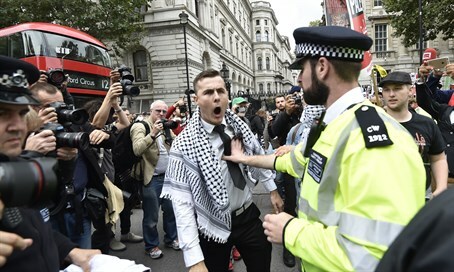 Condemnation rushed in Wednesday from British government ministers and Jewish groups after reports of a violent riot by anti-Israel activists at a leading London university. Police were called to King's College London University on Tuesday night, after a speech by former Shin Bet chief Ami Ayalon was attacked with shocking violence by pro-Palestinian groups. Anti-Israel activists from the "Action Palestine" student group hurled chairs at people attending and set off fire alarms in the building more than a dozen times in order to disrupt the event, reportedly also physically assaulting event co-host Esther Endfield. Britain's Universities and Science Minister Jo Johnson blasted the activists for their "violent intimidation," telling the UK's Jewish News that "Britain and Israel share many important academic links and speakers must be able to address meetings peacefully." "Our universities should be safe spaces for students to expand their minds, and there can be no justification for violent intimidation that curtails free speech," she stressed. Baroness Shirley Williams, Britain's Communities Minister, also tweeted her condemnation: "Appalled to hear reports of violent protests at Kings College Israel Society meeting yesterday. Totally unacceptable." A spokesperson for King's College said the university was launching an "urgent investigation" into what had happened, stressing it would "not condone the use of any form of violent protest."